ReSound was the first to offer Wide Dynamic Range Compression and Digital Feedback Suppression, innovations in sound processing that have led to reduced distortion and better sound quality. Based on more than 70 years’ creating innovative hearing solutions, ReSound has taken this knowledge and developed Smart Hearing technology. With the goal of creating a natural listening experience, this technology combines their expertise in audiology, connectivity, apps and design to empower those with hearing loss to experience, connect and communicate. 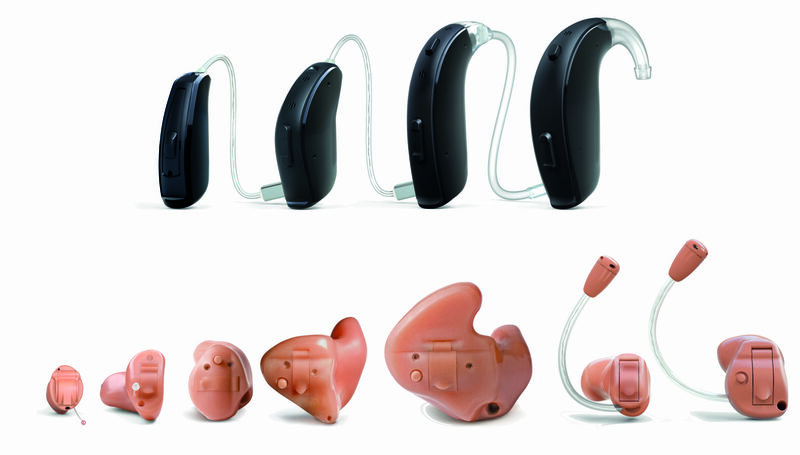 ReSound hearing aids offer superior sound quality in small, discreet packages. Spatial Sense technology provides users with a clear and natural sense of the sounds around them. The ReSound LiNX 3D is up to 50 percent better at identifying speech in various environments, allowing you to hear up to 80 percent more of the sounds around you and up to 40 percent more speech in noise. The ReSound LiNX Quattro™ is the world’s first Premium-Plus hearing aid with unprecedented Layers of Sound™, providing users with a truly brilliant sound experience. The ReSound Smart 3D app puts the controls in your hands. You are able to change the volume and select a new setting right from your smartphone. This makes the process of adjusting your hearing aid more discreet than ever. The app also helps you find your hearing aids if they are misplaced. ReSound LiNX 3D Rechargeable provides great sound quality with a convenient and cost-effective option. Never fuss with changing a battery again with this model. The ReSound LiNX Quattro™ is the world’s most advanced rechargeable solution. ReSound’s wide range of wireless hearing aid accessories can improve your hearing experience. They are designed to work together flawlessly with your ReSound hearing aid. Accessories range from improving your hearing in noisy situations to streaming sound from your television directly to your hearing aid. ReSound Up Smart is a new hearing aid that adapts to the way children live today. It features improved sound quality, wireless connectivity and accessories and is available in a wide range of attractive colors. This hearing aid also connects wirelessly to an iPhone®, iPad® or iPod touch®, acting like wireless stereo headphones.